Time is Ticking… Income Tax Refund – Furniture Super Sales Event! THE LARGEST SALES EVENT IN THE HISTORY OF SAVVY LIVING FURNITURE!!! From now until 14-April-2019, Savvy Living Furniture is offering the largest discounts on nearly every product in our Web Store. Save $ Hundreds $ on Living Room Sets, Bunk Beds, Sectionals, Dining Room Sets, Sofas and Love Seats, Bedroom Sets, Loft Beds, Mattresses, Youth Collections, Sofa Beds, Living Room Furniture, Patio and Outdoor, Youth Bedding and More!!! With the help of our manufacturers, nearly every product in every category has been heavily discounted. Prices and Products are updated weekly! Now is the time to buy with your Income Tax Refund! Didn't receive a refund but have to pay income tax? Don't worry, our low prices will still save you $ Hundreds $ so you can still make your dream purchase! Start Shopping Savvy Living Furniture Today and make you house a Home again!!! Today is Small Business Saturday, please shop with us! We are merely a "Ma & Pa" small business doing our best to provide 5 Star Customer Service with top quality products. "Time to shop local" We appreciate you taking the time to browse our website in hope you will find some furniture that will make you excited!!! From now through Christmas Eve we have super discounts on 100's of items. You can choose from Bedrooms and Mattresses, Dining Rooms and Outdoor, or add a new Sectional or Sofa to your Family Room. Happy Holidays and Thank you for considering Savvy Living Furniture! YEAR END FURNITURE AND MATTRESS SUPER SALE! From Now through December 24, 2018 check out our GIANT YEAR END SUPER SALE! We have marked down prices in ALL categories. Discounts on Dining Room Sets, Sofas and Sectionals, Bedroom Sets, Patio and Poolside, and even our Kids Bunk Beds. Need a new mattress? We have the best prices on top quality Traditional Spring and Modern Memory Foam Mattresses!! We offer HUGE discounts on already low prices, well below retail pricing! Shop now and save and remember to purchase immediately. This time of year it is difficult to keep inventory so if you see something you like be sure to purchase it ASAP. As you shop through the Savvy Living Furniture website notice how many items are marked "Sold Out" and will not be back in time for the Holidays which are already upon us! Shop smart and save with us. We offer FREE DELIVERY AND ASSEMBLY on ALL our products! No one does that!!!! 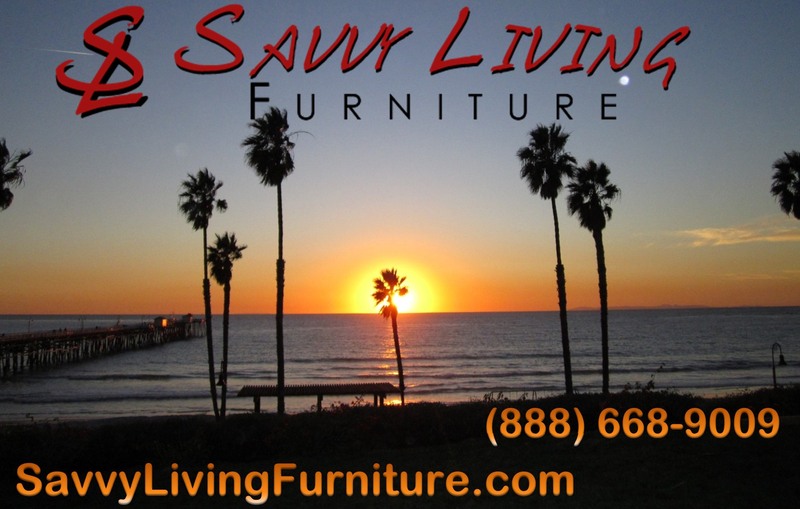 Feel free to call or email us if you have any questions; (888)668-9009 and/or SavvyLivingFurniture@gmail.com Great Prices, Great Products and 5 Star Service!!! Remember to read our Reviews: https://savvylivingfurniture.com/reviews/ Thank you for visiting Savvy Living Furniture. Savvy Living at Savvy Prices! Moving into a new home and need new ideas for interior design and decorating? Perhaps you need ideas for the whole house or just one or two rooms. Maybe you would like to redesign your current home? Here is a simple suggestion to help spark some creativity. Go to a furniture website and start shopping for furniture! Yes, that's right... Furniture Websites. The reason is furniture manufacturers spend millions of dollars staging the furniture they are trying to sell. Some hire in-house Interior Designers and others spend high dollars contracting famous Interior Designers to help sell their products. The interior designers, sometimes with the help of photographers, create the entire room and feel of the room for a particular piece of furniture. Literally, the room is created and decorated to sell the piece or pieces of furniture in the photograph. After all, in today's Modern World most people shop for all their needs online, including furniture. The manufacturers know this. So whatever it is they are trying to sell they are going to make the photo look as best it possibly can. Creating the background for the product is just as important as the product itself, if not more. This is the same for all industries whether is be fashion, jewelry, automotive, or travel... everything in the photo helps sell the product. So take advantage of all the money the manufacturers spend on making their product look outstanding and pay attention to the background. For example, lets take a look at our #1 selling girls bunk bed; the Bianca White Twin over Twin Bunk Bed What young lady would not want a bedroom that looks like that?!? Twice this year we have arrived to our customers house for assembly and the walls were decorated and painted just like that. They also purchased the near matching bedding from us too. No doubt the bed is excellent quality but let's face it, it's white. So with a perfect interior design set complete with accents and bedding helps this bunk bed become our #1 seller for girls. If you think interior design is easy for a child's room, let's look at a more difficult room like the living room. Lets check out Dawson's Contemporary Sectional. This unbelievably comfortable sectional is has a solid, hardwood frame, neutral colors, and is very inviting. The quality and size of this sectional for the price is remarkable Notice the decor with room highlights to match the colors of the sectional. The ceiling and tables match the pillows, carpet and back wall to enhance the seating. Even a fireplace to add a spark of color. I have never seen beige and brown look so inviting! In my opinion, one of the most difficult rooms of a home to decorate is the Bedroom. This example is kept simple and they have made the simple look elegant and comfortable. Beginning with used brick wall paper, a fashionable rug, straightforward artwork and a properly placed plant the Santora's Modern Dark Walnut and Concrete Bedroom Collection is absolutely stunning And finally, you can even take it outside for ideas for your pool or outdoor patio. This attractive 3 piece outdoor set is accented by multicolored plants and bushes, matching deck and beautiful blue sky backdrop. No fancy beaches or palm trees needed. The setting for the Westport 3 Piece Outdoor Patio Teak Collection is welcoming So when you are looking for a creative spark to help with your interior design and decorating needs all you have to do is search the internet for furniture stores like Savvy Living Furniture. Use the money other people have spent to make things look good. It's abundant, it's easy, and it's free! Savvy Living at Savvy Prices! Thank you for visiting Savvy Living Furniture!!! A question we often receive is, "Why are the prices so different from one store to the next?" My response always is, "You have to compare apples to apples and oranges to oranges." In today's modern world almost everything is manufactured overseas. This isn't necessarily bad since the huge savings in labor costs usually result in a much lower retail price. If the overseas factory has an American Quality Control team than the manufactured goods can still be of very good quality. But like all things manufactured in business someone always wants the same item for less money. This is where the problems begin and exist in all industries whether it be the automobile business, the wine business, or the furniture business. There are obvious benefits to online shopping; large discounts applied to online products. A disadvantage is that you don't get to inspect the product. Today's modern shoppers have to rely on descriptions, photos and reviews of products when shopping online. So how do you really know the quality of the product? It's best to know and trust the online retailer you are dealing with. Let's use a leather sofa for an example. I have an overseas manufacturer who makes a leather sofa for $2600 wholesale, and I retail this leather sofa for $3000. The sofa is 9', full grain leather, solid hardwood frame, recliner on the end, top of the line hardware and mechanisms, extra support memory foam cushions, lumbar support, and double stitched seams, Here is a photo of the finished product: Another manufacturer comes to me and states he can make me the same sofa for $2200 which I can sell for $2600. The sofa is the same except it is no longer full grain leather as the sides and back have been replaced with leather match. This is common practice in the industry to save money for those that cannot afford a full leather sofa. Here is a photo of the finished product: Yet another manufacturer comes to me a states he can make the same sofa for $1900 which I can sell for $2200. He takes the extra support out of the seat cushions, replaces memory foam with cotton stuffing, and uses cheaper hardware and mechanisms. Here is a photo of the finished product: The next manufacturer does a similar thing. For $1500 wholesale and $1800 retail, the 9' sofa is now 8' 6". It has single stitching in the seams, and the frame is soft wood instead of hardwood. Still the same photo. Along comes another competing manufacturer and for $1100 wholesale and $1300 retail the sofa is now 8'. The frame is plywood and particle board, and the full grain leather is now 5 layer bonded leather. Yes, still the same photo. So this process continues. In order to make the same sofa less expensive it must be made "cheaper". The only way to reduce manufacturing costs is to use lower quality components to manufacture the final product, in this case a leather sofa. The final manufacturer offers the lowest possible price, for $400 wholesale and $549 retail. The sofa is 7' single layer bonded leather, vinyl back and sides, single stitching, plastic filled cushions, particle board frame, cheapest possible hardware. Here is a photo of the finished product: In one year you will not recognize the "$549" sofa and it will be comfortable for a few months where the "$3000" sofa will become more comfortable over time and will last generations. Is this comparing apples to apples? No it's comparing a raisin to a Densuke watermelon. In other words, don't trust the photo with the price. If our Bunk Bed is X Dollars and you see the same photo on another site for 1/2 the price... it's not the same product! So, YES, you do get what you pay for. A $1200 bunk bed is going to be exponentially better than a $500 bunk bed. Same with a leather sectional, a bedroom set, and most furniture. Finally, there is the "NO, you don't always get what you pay for". This applies to mattresses and designer furniture. Savvy Living Furniture got into the business when trying to buy our first mattress. The price markups on mattresses are ridiculous. As of today, you should never pay $5,000 to $10,000 for a mattress. The finest quality mattress made with the finest quality materials and the best workmanship should not cost more than $2,000 for a King, (And yes that includes the box spring if needed). Everything over that is money in their pocket. Our mattresses are a fraction of that and we even make a Custom mattress for less than that. Designer furniture is the other exception. Most designer furniture is made with the best quality materials and components. However, you are paying for the designers label and artistic abilities. If a designer sofa costs $15,000 compared to our $3,000 sofa the quality is no better. You are paying for the design itself. Remember, Savvy Living Furniture only sells Top Quality Products. It's the reason why all our reviews are 5 Star Reviews. There is so much substandard furniture out there and we refuse to sell any of it. Yes, there are bunk beds for $299 and sectionals for $499 but you can guesstimate the poor quality. You will never have to worry about quality with Savvy Living Furniture. We truly offer you the best quality for your money. Savvy Living at Savvy Prices! Labor Day Super Sale 2018 – ONLY 1 WEEK REMAINING!!! ONLY ONE WEEK REMAINING for our 5th Annual Extended Labor Day Super Sale!!! From September 3 through September 10, 2018, we heavily discounted prices on your favorite Bedroom Sets, Kitchen and Dining Sets, Living Room Sets including Sofas, Couches, Sectionals, Sleeper Sofas, Love Seats and Recliners. Don't forget our OUTDOOR and PATIO Furniture! HUGE discounts and will EXPIRE on 9/10/2018!!! Visit our website today! https://savvylivingfurniture.com/ Call or email us for ALL YOUR FURNISHING NEEDS: (888) 668-9009 or SavvyLivingFurniture@gmail.com Savvy Living at Savvy Prices!!! Discount Online Furniture: 4 Intelligent Reasons To Purchase Furniture Online Why buy furniture online? Here are simple solutions to realize when considering buying furniture online. When you seriously consider the benefits associated with buying furniture online, you'll quickly understand why "brick-and-mortar" furniture outlets are very nervous these days. You can find furniture online, hugely discounted, that you would not be able to find anywhere else with the least amount of effort on your part. Four Intelligent and Frugal Reasons to Buy Furniture Online: Huge selection! The highest quality furniture from around the planet comes together in one central location for your shopping convenience. You'll search extensively to find a "brick-and-mortar" furniture store that offers top quality products from manufacturers around the globe at prices competitve with Savvy Living Furniture online. We personally shop for and inspect every product we sell so you don't have to! Save Tons of Time! You will save so much time shopping for furniture online that you'll never want to take the traditional approach again. You don't have to drive to various regional furniture outlets, and walk around giant showrooms, to compare products and prices. When you purchase from SavvyLivingFurniture.com, comparing pieces is just a mouse click away while in the comfort of your own home. There's no need to haggle with commission-based sales people. You see all of the information that you need to make smart purchasing decisions simultaneously and clearly. The price you see is the price you pay, everyone pays the same price, so you know you are getting the best deal! Quick and Professional Delivery! When you buy furniture online at Savvy Living Furniture, you'll experience timely, responsible delivery; directly to your door. Savvy Living Furniture has a huge selection and you pay conveniently and securely online. In a matter of days our professionals will deliver your furniture and assemble it for you! (Assembly area restrictions apply). Every purchase from SavvyLivingFurniture.com is a custom delivery... we only deliver when it is convenient for you. This is as easy as it gets!!! Save Tons of Money! Since we are online we do not have the cost and expense of a lease and the overhead and maintenance of a "brick and mortar" store. We planned this intentionally. Lower overhead equals lower cost to consumer. Also, since we are a "ma and pa" store there are no sales people that require comissions and other related expenses. Truth is - that type of overhead is expensive, So by selling online we can pass the savings on to you. Whatever your furniture shopping budget is, you'll maximize the strength of every dollar when you purchase top quality furniture from Savvy Living Furniture. How great is that!?!?!!! Buying furniture online at Savvy Living Furniture is the only realistic and sensible choice. It just doesn't make any sense to drive all over the place, walking through giant warehouses, and grapple with high commision sales people. Don't waste your time, don't waste your fuel, don't waste your money... SavvyLivingFurniture.com is the future of Furniture Shopping!!! Will recommend to all friends & family in a heart beat. Here is a post on Yelp, on 6/2/2016, from another return customer; "JJ & Freedom, you guys are not only the best people for busyness your products ROCK!! Will recommend to all friends & family in a heart beat. Thanks for being so professional and kind." Originally they purchased 2 sectionals form us, the Contemporary Tan: And Vail's White Sectional: They returned to purchase the Cape Cod Bedroom Set: Their house is almost furnished and looking ravishing with the new modern furniture! Believe it or not, stock goes fast so order your today!!!! Beyond impressed with the quality of the furniture and fantastic customer service! A great example of Victoria's Twin over Twin Bunk Bed with pullout drawers! 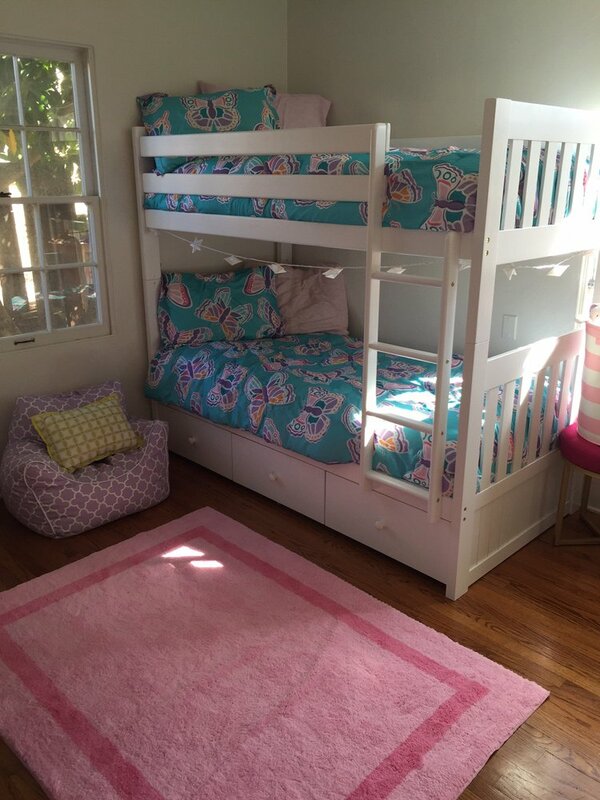 Beautiful Mom, Blair L., did a wonderful job in her selection of children's bedding for this stunning bunk bed. Here is what Blair had to say, "Beyond impressed with the quality of the furniture and fantastic customer service! I too was a bit hesitate to order online, but I took a chance and couldn't be happier with my purchase. JJ and freedom are the perfect duo!! They answered all my questions, called after receiving my order to make sure everything was correct and even delivered to my front door the next day!!! If that wasn't enough... They also set up my girls bunk ends and took all the boxes and trash as they left!" Special Thanks to Blair L. for choosing Savvy Living Furniture! We are very happy, kids aren’t sleeping but that’s out of excitement! Here is Jessica King with JJ Ermark celebrating her new place with a Brand New Queen size Jessica's Bed!!! The Jessica's Bed Collection was not originally on our website and "Jessica" was precise about her desires; subtle elegance. JJ did some shopping and found the perfect bed for Miss Jessica. We shopped around for pricing and found out we are hundreds of dollars less than our competitors, well, the few of our competitors that even carry this bed. 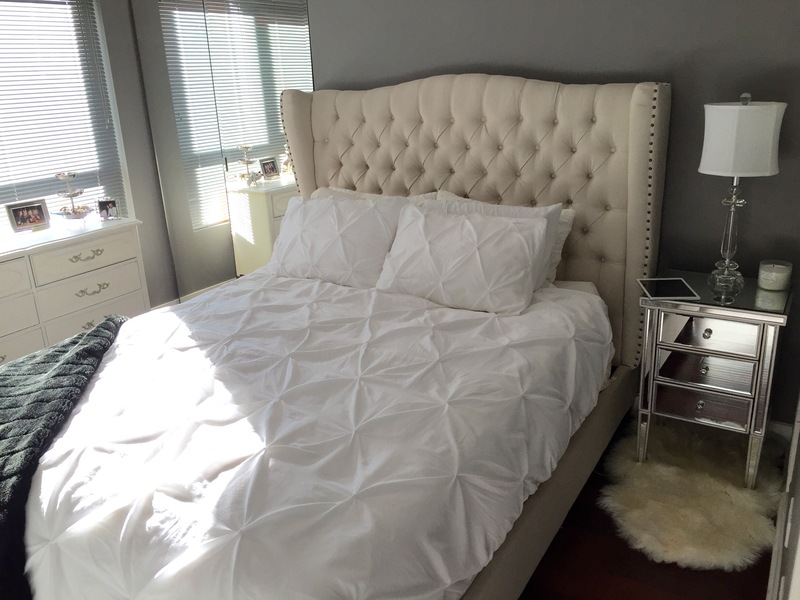 This Stunning Bed is available in Queen, King, and California King sizes. The matching Jessica's Bench is available too: Remember, even if you don't see it on our website we can almost always find what you are looking for. So visit SavvyLivingFurniture.com today and fill you new home with some new furniture. You wouldn't buy a new car and put the old car interior in it!!! Best Quality, Best Prices, Best Customer Service. The only thing more exciting than buying your Dream Home is furnishing it with Savvy Living Furniture! After all the packing and moving... do you really want to have to unpack and assemble new furniture? No Way! 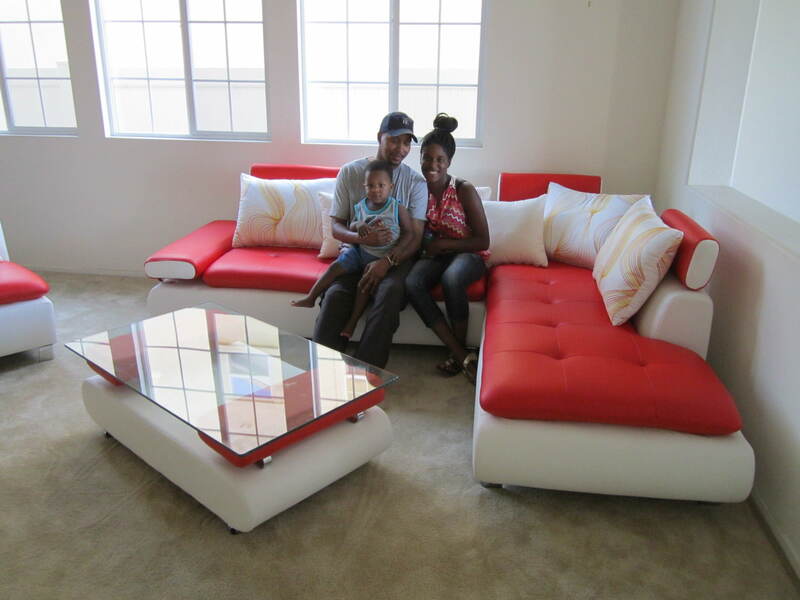 Pictured is Shauntae Travers with her fiance' Arnold and son Jordan enjoying their new Jersey's Sectional Sofa Set inside their Gorgeous new home. 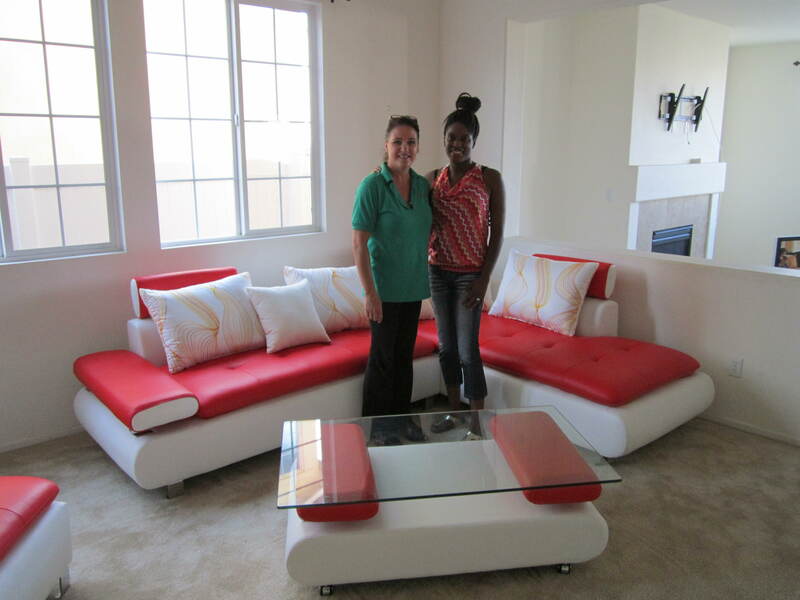 Shauntae told us she wanted the "Wow" factor when her guests walked into the home. The Jersey's Sectional Sofa Set does exactly that with its Stunning Red on White Chair, Chaise Lounge and Coffee Table! The throw pillows spice this set up perfectly. The Top Grain Leather makes this set Gorgeous and durable for years to come. 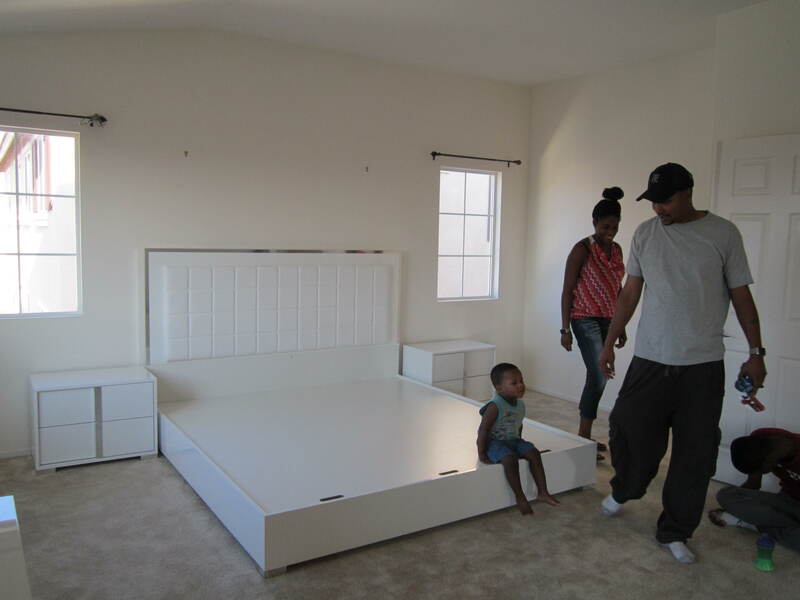 Here is JJ Ermark and Shauntae Traveres with the new set and a huge smile: Shauntae and Arnold did not stop there.... With a HUGE home and Fantastic Master Bedroom they decided on the Classy and Elegant Cape Cod 5 Piece Bedroom Collection in White. This Italian Made Bedroom Collection comes in Stunning Gloss White or Gray Lacquer finish. It's hard to see in the pics but the Headboard has Gorgeous LED lighting to really step up the sophistication. 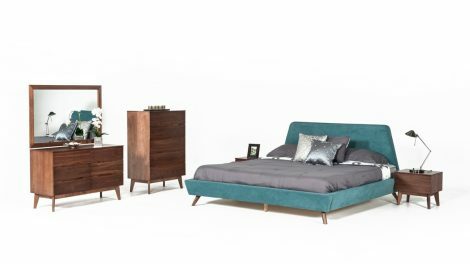 With matching Dresser of course: Unfortunately the Stunning Gloss White Lacquer on this Italian Made Bedroom Set did not come out in the pics :( One of the biggest misconceptions in Mattress sizes is the difference between California and Standard/Eastern King. The EA King is 4"-6" WIDER and the CA King is 4"-6" LONGER. Think of it this way; If you are 6'4" Tall or more... go with the CA King. If not, go with the EA King and take the wider bed!!! Don't forget Savvy Living Furniture for ALL your home furnishing needs!!! Micah’s Bunk Bed, Micah’s Bunk Bed… Mr. Popular!!! Here is Maribel and Abraham Acuna enjoying their new Micah's Espresso Twin over Full Bunk Bed with Staircase Storage and Trundle. Maribel and Abraham decided to use the trundle as an optional bed, rather than a drawer, and upgrade the mattresses to 2 MLily 9" Gel Memory Foam Twins and a MLily 10" Harmony Memory Foam Full mattresses. Their kids will be sleeping sound for years to come on this stunning setup. With top quality furniture and super competitive prices why would you choose anyone but Savvy Living Furniture? Hey, it's your money and you could do with it as you wish. But if you want to be Savvy with you money than Savvy Living Furniture is the Savvy Choice! Order your Micah's Bunk Bed today before supplies have vanished!!! Micah’s Bunk Bed is now our #1 Selling Bunk Bed! When you see the smiles on the kid's faces, you realize why Micah's Espresso Twin over Full Bunk Bed with Staircase Storage and Trundle has become our #1 selling bunk bed! Here is Lorretta and Rosanna Barling, from Los Angeles, enjoying their new bunk bed soon after our delivery and assembly. With new mattresses and bunkie boards, you just can't go wrong with Savvy Living Furniture quality, prices, and customer service. We would never sell you anything we would not use for our own children. Quality merchandise at competitve prices, or, as we like to say, "Savvy Living at Savvy Prices!" 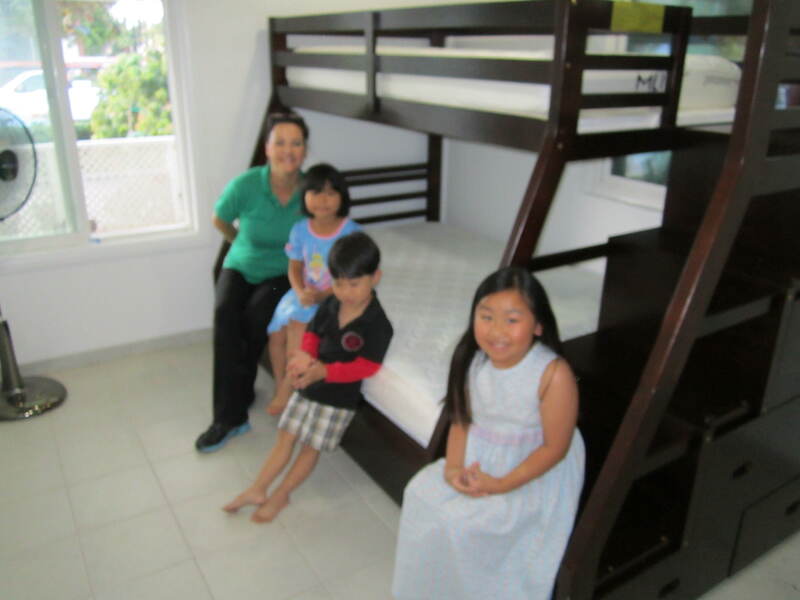 Here is JJ Ermark with the Quach children enjoying their new Micah's Espresso Twin over Full Bunk Bed with Staircase Storage and Trundle. 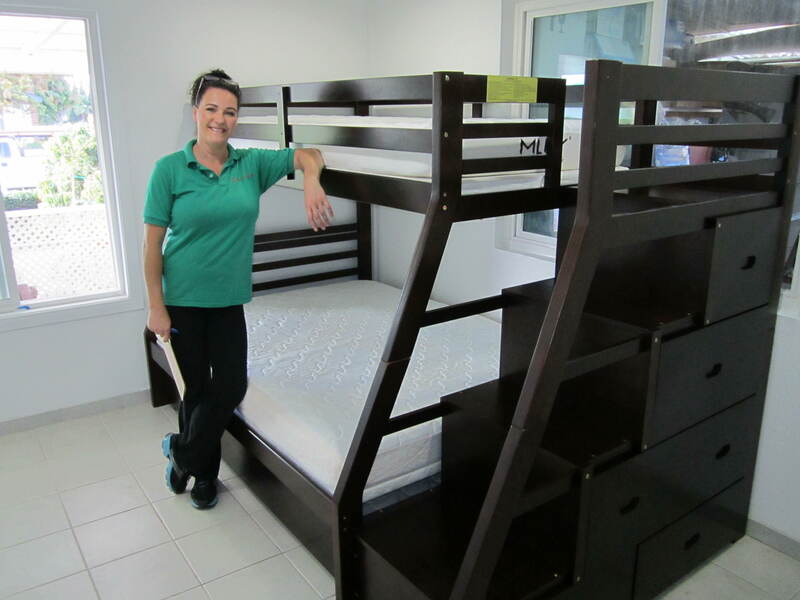 Diem Quach wanted the best for her children and purchased the MLily Premier+Gel Memory Foam Mattresses for the new bunk bed. The trundle can be used as a pullout drawer or a pullout bed. In this case, Diem went with the pullout bed and purchased 3 mattresses. IT is always such a pleasure to see the happy kids and the smiles on their parents faces upon completion of delivery and assembly, it's an experience we will never get tired of and never forget! A special Thank You to our Customers for choosing Savvy Living Furniture!!! 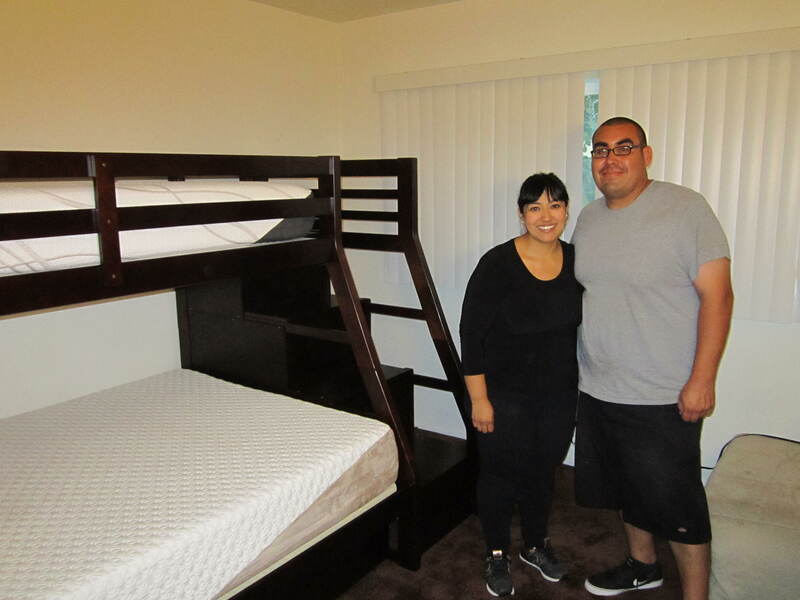 Here is Maria Garcia and Family, from Whittier CA, with JJ Ermark and the Thomas Express Bunk Bed Delivery and Installation. We only carry 1 Metal Bunk Bed since most metal beds are constructed of poor quality. We carry Thomas Express Bunk Bed since we know it's top quality and reputation. It's also a very popular Bunk Bed! It's about 4 hours to put this one together so make sure you buy your furniture from Savvy Living Furniture since we offer Free Delivery and Assembly in Southern California.on most of our products. Children are always excited to get thier new Bunk Bed and the Garcia Family is no exception. Just look at the excitement!!! 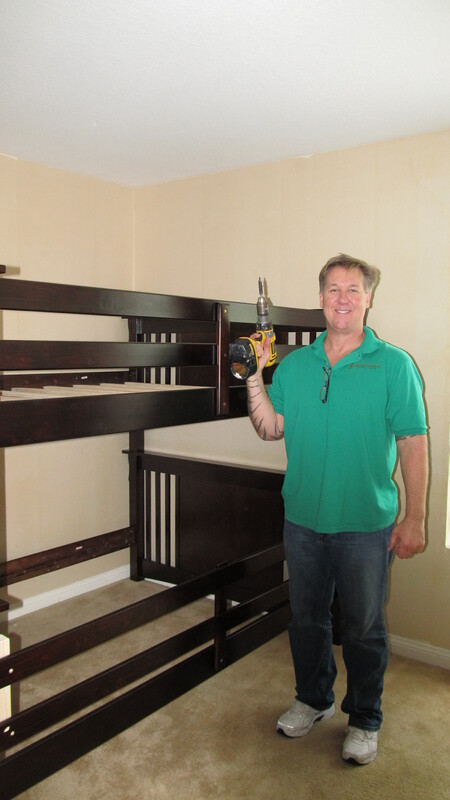 JJ Ermark and Skip Pfeifer, of Aliso Viejo, CA, after Delivery and Instalation of Kasper's Twin over Twin Espresso Bunk Bed with Stiarcase Storage and Trundle. 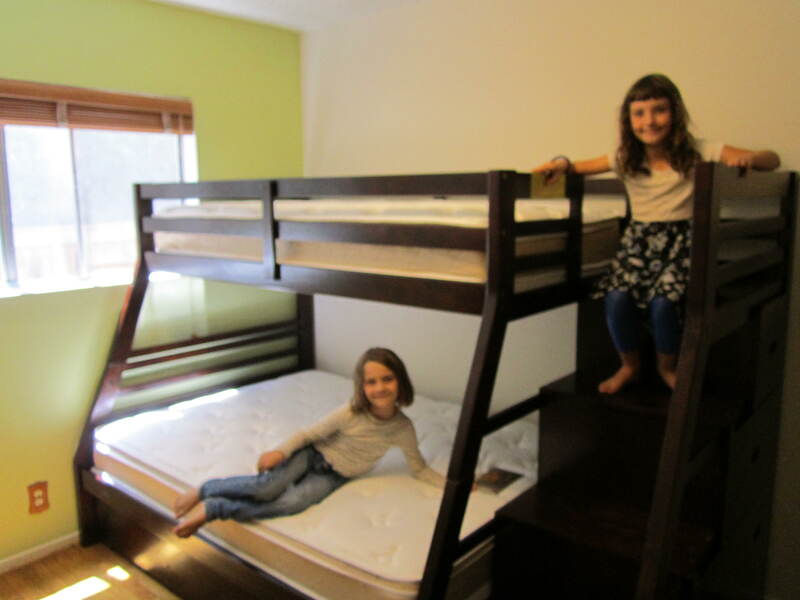 Skip spoiled his kids with the incredible Visco Memory Foam mattresses and Bunky Boards. As all our customers, Skip was ecstatic when we were done with the intall. 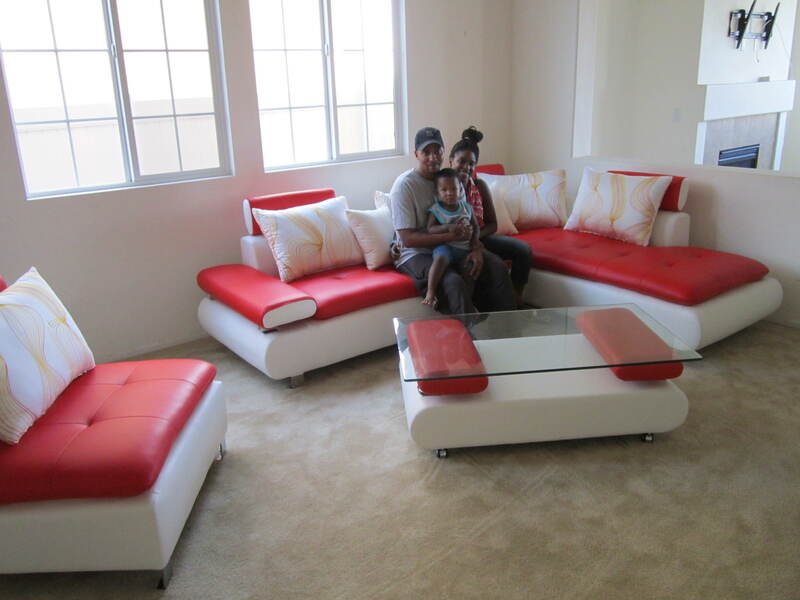 Here is a copy of his review on Yelp" Savvy Living Furniture was amazing! 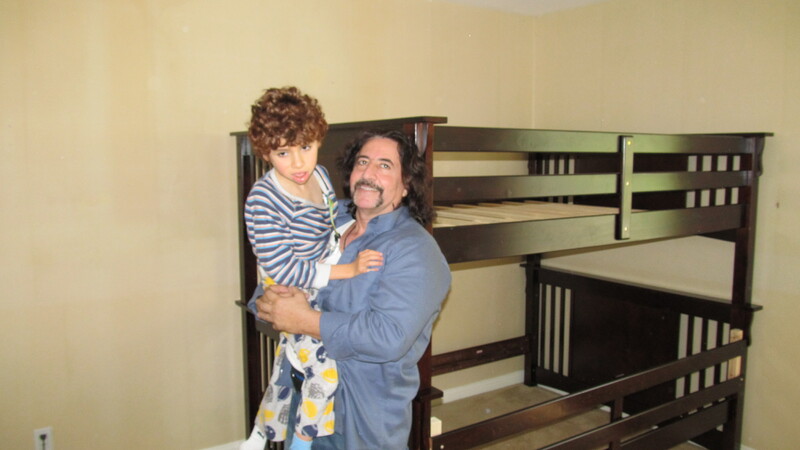 "Freedom made the entire process of purchasing the bunk bed for my boys seamless. He suggested their most popular selling bed, paired it with two mattresses, and had an install date for me immediately. When I mentioned I might only need one mattress, he had a cost comparison for me immediately, and gave me a few options. He was prepared, patient, made intelligent suggestions, and helped me make a purchase that I felt great about. 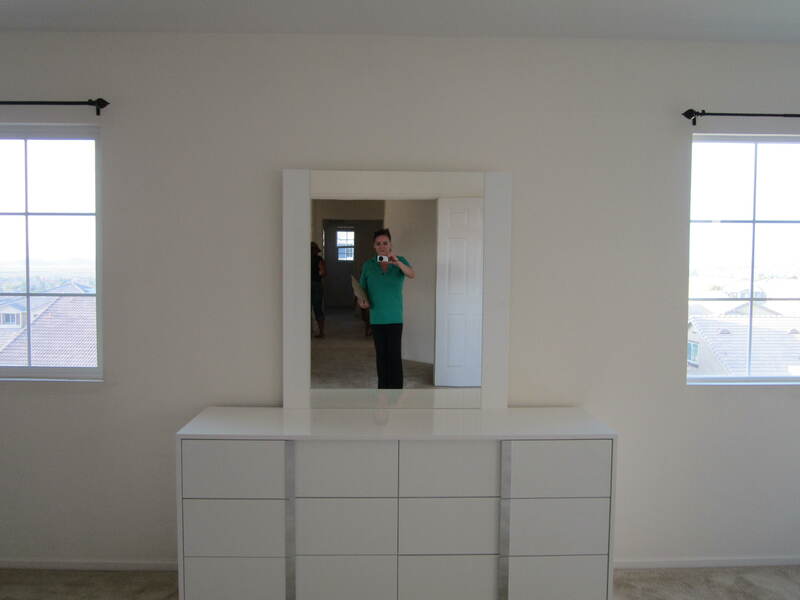 He personally handles the installation on site, and after five minutes you feel like you've known him for years. The bed was top quality, it was everything he represented the product would be, and my kids were thrilled. Savvy Living is an An A+ outfit.!" 5 Stars Schedule your Delivery and Assembly Today!!!! JJ Ermark with Judy Fowler and Family in Fallbrook, CA after Delivery/Assembly of their new Kasper's Twin over Twin Epresso Bunk Bed with Trundle and Staircase Storage. 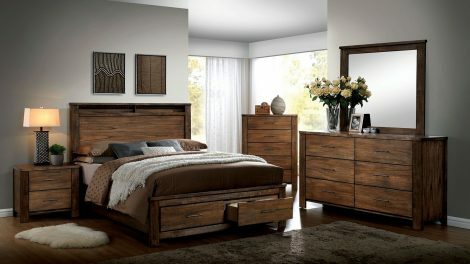 This bed is so good looking with it's Brushed Nickel Hardware and Cedar Lined Drawers. This bed makes any kids bedroom look great! This assembly takes approximately 4 1/2 hours to complete but we are glad to do it when we have the opportunity! Read our reviews and you will see why all our customers love us. Order today and schedule your Five Star Service! Another one of our Happy Customers, Muhammed and Jo Jo Yusif, in the main picture. As usual we delivered and assembled the Espresso Full over Full Bunk Bed. This delivery was a little different and the bunk bed required some modifications for Muhammed's special needs son, Jo Jo. Savvy Living Furniture is more than happy to help in any way possible, and after selecting the correct bunk and doing some modifications to his new bed, it was no problem at all. We enjoy helping as much as possible anywhere we can. 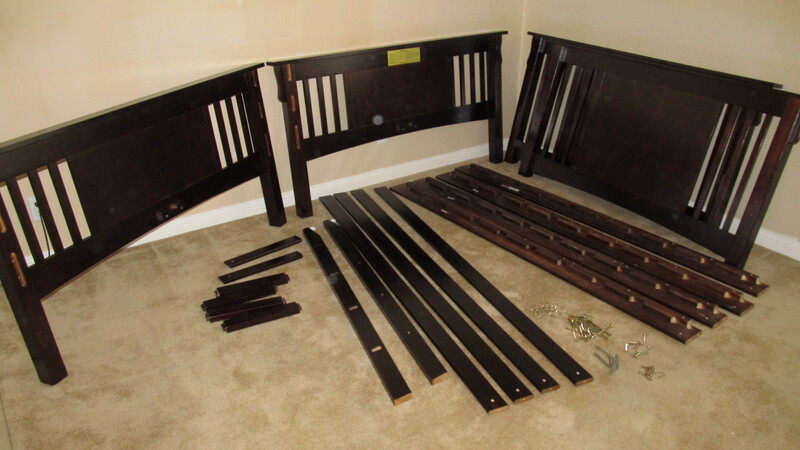 In the other pics you can see how many parts there are to a bunk bed, not just the solid wood materials, but many different types of hardware. That is the reason we like to do the assembly for you so your furniture purchase is never overwhelming! Freedom Mayjack and JJ Ermark next to the finished Bunk Beds. Labor Day Weekend Furniture and Mattress Super Sale EXTENDED! Now, through September 9, 2014, enjoy our Store wide Super Sale on our most popular Furniture and Mattresses. We have special prices on your favorite Bedroom Sets, Kitchen and Dining Sets, Living Room sets including Sofas, Couches, Sectionals, Sleeper Sofas, Love Seats and Recliners. Don’t forget our mattresses which are the finest quality possible, best-in-industry warranties, made with “green” premium materials including soy based foams to protect our environment. And if that is not enough to earn your business; the mattresses are manufactured right here in Southern California?!?!?! We offer the finest quality, the best prices, and #1 ranked customer service… What more can we offer you? If there is something you believe we are not offering you please let us know and we will do our very best to accommodate your needs. Need custom furniture? We have that too!!! So visit our website today and begin a new adventure in shopping… Savvy Living at Savvy Prices!!!! Now, through the end of Labor Day Weekend 2014, enjoy our Store wide Super Sale on our most popular Furniture and Mattresses. We have special prices on your favorite Bedroom Sets, Kitchen and Dining Sets, Living Room sets including Sofas, Couches, Sectionals, Sleeper Sofas, Love Seats and Recliners. Don't forget our mattresses which are the finest quality possible, best-in-industry warranties, made with "green" premium materials including soy based foams to protect our environment. And if that is not enough to earn your business; the mattresses are manufactured right here in Southern California?!?!?! We offer the finest quality, the best prices, and #1 ranked customer service... What more can we offer you? If there is something you believe we are not offering you please let us know and we will do our very best to accommodate your needs. Need custom furniture? We have that too!!! So visit our website today and begin a new adventure in shopping... Savvy Living at Savvy Prices!!! !